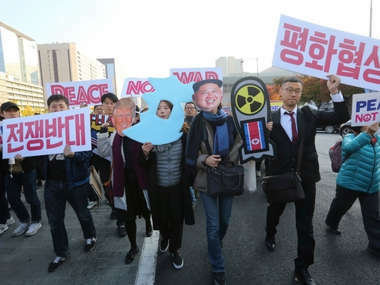 Seoul: Hundreds of South Koreans protested on Sunday against an upcoming visit by Donald Trump and called for peace as the US President begins an Asian tour dominated by North Korea's nuclear programme. Trump, who arrived in Tokyo, is set to visit the South from Tuesday to Wednesday as part of his first Asian trip as head of state that also includes Vietnam, China and the Philippines. He is scheduled to hold a summit with President Moon Jae-In and visit a US military base, with all eyes on his message to the North and its leader Kim Jong-Un. South Korea is a key US ally and hosts 28,500 US troops but many of Trump's critics in the South see him as a warmonger whose recent war of words with Kim has heightened tensions on the flashpoint peninsula. "We oppose war! Negotiate for peace!" the protesters chanted in central Seoul, waving banners and balloons emblazoned "Peace, not war" and "We want peace". Many protesters slammed both Trump and Kim for heightening the risk of conflict. "Trump and Kim are using the current military standoff for their own political gain, while we South Koreans are trembling with fear of war!" one activist said on stage. One mother whose son is serving the South's mandatory two-year army conscription accused Trump of putting her son's life at risk. "My heart stirs at every single word Trump says about North Korea," she said. Organisers estimated the number of protesters at around 2,000.